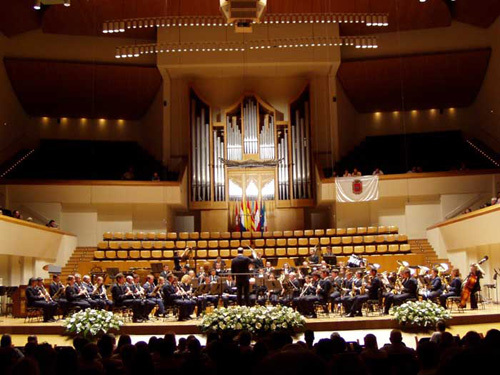 The Municipal Band of Valencia (Banda Municipal) has finalized its list of concerts for 2009, which take place in or around the Palau de la Música (location), and all of which you can attend for free. 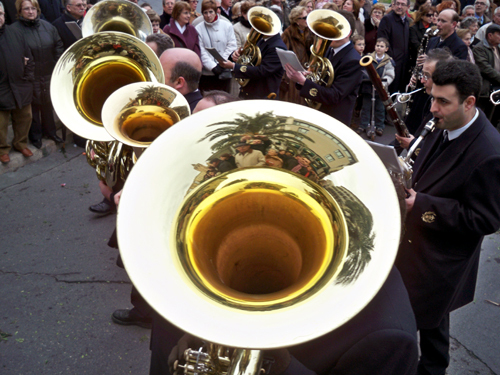 The band, currently under the direction of Pablo Sánchez Torrella, has made up an important part of Valencia’s musical scene since 1903, the year of its founding. 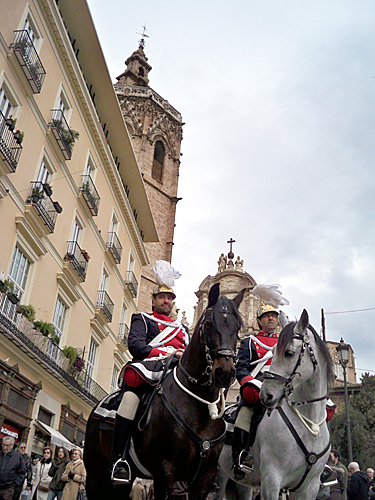 The band puts on up to 90 performances a year in and around Valencia. Additionally, there are 4 outdoor concerts in the gardens of the Palau, every Thursday in June at 20:15 — I’m assuming these are also free. Great news for lovers of rock! Two more awesome bands have been added to the lineup of the MTV Winter Festival, headlined by Franz Ferdinand, which will take place in the City of Arts & Sciences on February 24th. Mando Diao (Sweden) and Starsailor (Britain). Mando Diao is a name that will be familiar to most alternative rock fans. They’ve been around since 2002, and have had a number of hits. They’re latest one is called “Dance With Somebody”, and is currently in rotation on European radio stations… great track. Alright! Considering that entrance is free, and the number of famous rock bands that tour Valencia is farily small, I’m guessing that the City of Arts & Sciences is going to be jam packed on February 24th. Exciting. 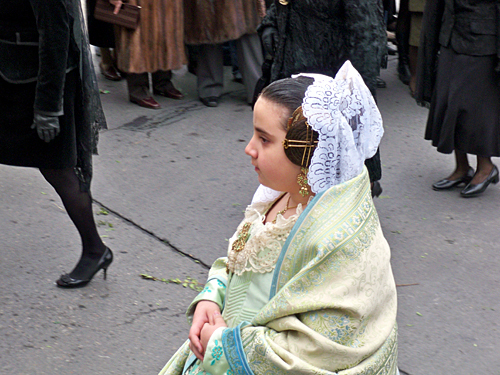 Yesterday, we previewed the events which would be taking place on January 22nd, the day of San Vicente Mártir — Valencia’s patron saint. And today, we went out into the howling wind to attend the festivities. 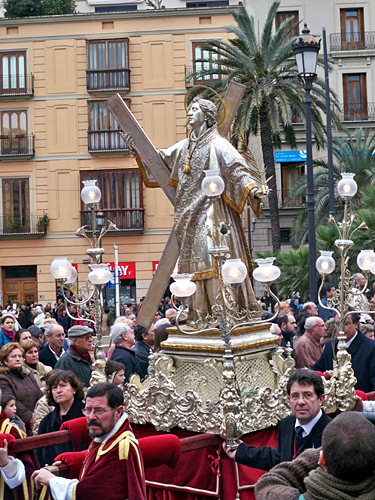 First, a procession around the city cathedral got off to a very late start. It was a small, and sparsely attended event. 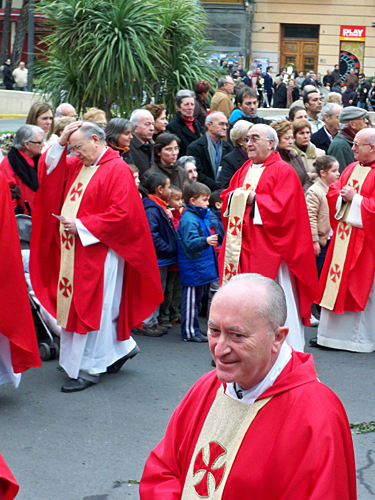 Just a few hundred marchers — mostly religious leaders and older women, often dressed in mourning. The music was beautiful though. 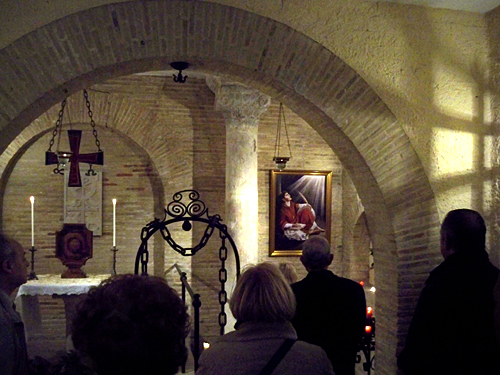 The procession goes right by the Jail of San Vicente Mártir (location), and we took a peak inside. It’s a small room, as you might expect a jail to be, with just the column where the early Christian was bound and tortured, and a well that was discovered in 1777. 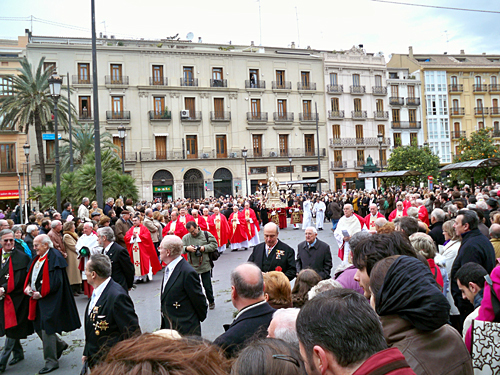 At 2pm, we went down to Plaza de España (location) for the scheduled mascletà. 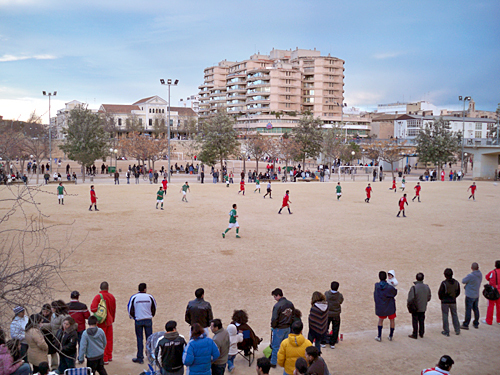 Mascletita would have been a more appropriate name — it was extremely small, and over in about a minute. But since we were able to stand so close, the explosions were just as violently loud as normal, if not more so. 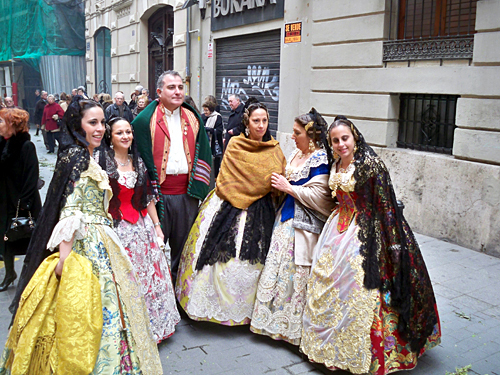 For the first time at a mascletà, I had to cover my ears. Vicente Martir Festival Valencia from Valencia Blog on Vimeo. 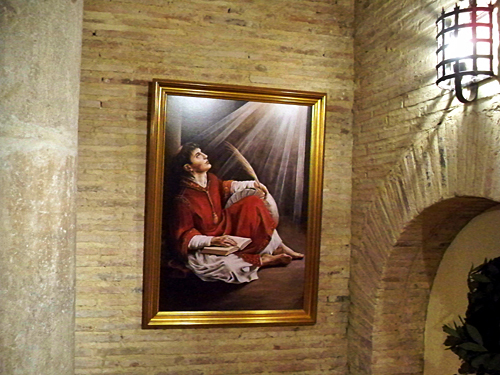 San Vicente Martír was born in Huesca in the 4th century, and studied religion in Zaragoza. 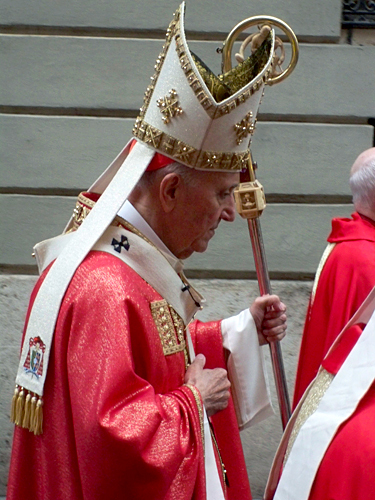 In those days, Christianity was more like a cult, and the Roman emperors still in charge looked upon it disfavorably. So disfavorably, in fact, that they issued edicts to wipe out any Christians they could round up. 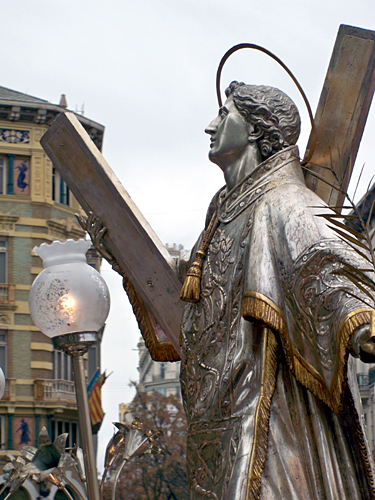 As such, Vicente was arrested and forced to walk in chains from Zaragoza to Valencia. 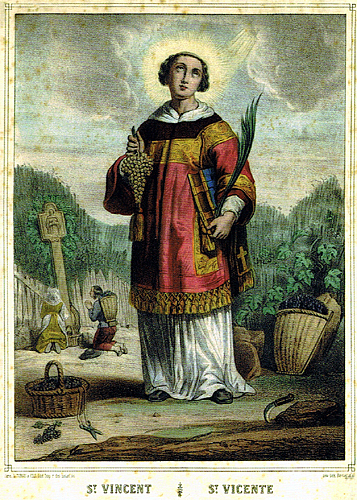 Along the way, he astounded both his captors and peasants by performing miracles related to water. This is why the discovery of the well in his jail cell was such a big deal — well-finding was precisely the type of miracle he worked. 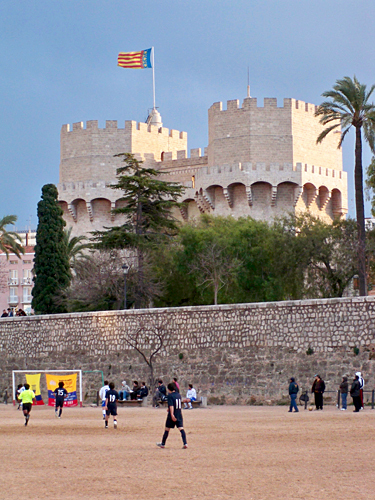 Upon arrival in Valencia, Vicente was jailed, reviled at, and tortured. But he never renounced his faith. And legend has that he died with a beatific smile upon his face, as his torturers were dressing his wounds, in preparation for another round. Phew, fun to be a Christian in the 4th Century!